Yes, these are hoodies for your drinks with an amusing name: Chuggies. 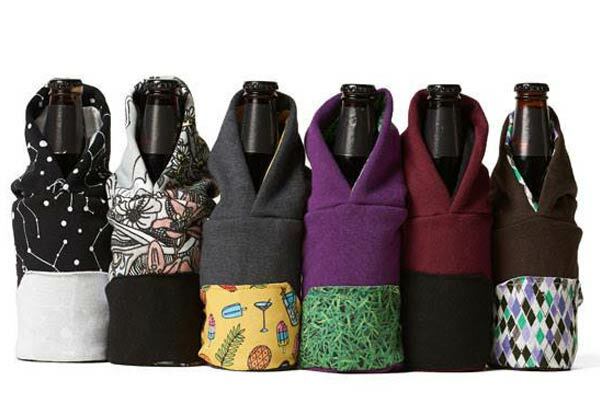 They’re collapsible insulated bottle hoodies for 12 oz bottles and longnecks. Chuggies make for an amusing way to hide your drinks while keeping them cool and your hands dry. Get your furry friend ready for chilly weather with the Pet hoodies. This pull-over hoodie is ribbed at the sleeves and hem, while the high-cut tummy helps to prevent soiling. And don’t worry about using it with a leash, because there’s a convenient leash hole for attachment. The ice tray the cool cats use. Rock your next gathering with a ‘Six String Screwdriver’ or a ‘Whammy Bar Whisky Sour’ served with these rockin’ ice cube guitars. They’re perfect for stirring drinks and making Ice Pops. When you can’t make it out to the ring, these Luchador Bottle Openers will bring the passion, strength and color palette of Lucha libre to spar with your favorite drink. They are the ideal solution for wrestling the caps off of beer and soda bottles and makes for an amusing sight gag that will be hard to get tired of. Open wide! These savage hoodies look docile in normal use, but when you cross the arms across the chest, the animal springs into life with its jaws wide open and poised for attack. These hoodies are suitable for sports, normal use, and chomping around. Party cups loaded with personality – the Pick Your Nose Party Cups are printed with upper lips and noses, ranging from mustaches, buck teeth or a honker the size of a small pier. So every time someone takes a sip they get an instant nose job, and a few laughs from the crowd. Both a bottle opener and cap launcher – not only allows you to pop caps off of your beverage, but can be used to shoot the cap almost 20 feet away. With this little gadget, opening your drinks has just got mischievous. Ideal gadget for breaking the ice at any party (or getting in trouble). vapRwear hoodies have hookah-like drawstrings at their necks that connect to the included DLo3 vape systems for the inconspicuous toking of waxes, oil blends and e-juices. The vapRwear line currently offers over a dozen hoodies in both pullover and zip-up for both men’s and women’s styles. Your home is your own personal Valhalla, and a godly home needs a godly bottle opener. This is, of course, if you’re worthy and thirsty enough to wield the mighty Mjolnir Bottle Opener. Feel the power in your hand as you pop open brews for your fellow beer gods.